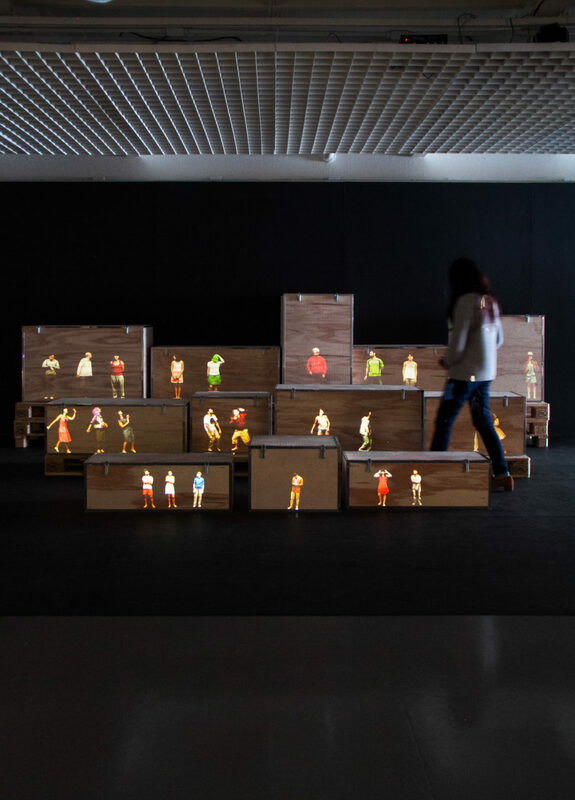 “Little Boxes” is a Kinect driven projection mapping (video mapping) art installation where tiny people projected onto wooden boxes are terrified of your presence. Even though they are all individuals who can move around on their own, they behave with a united mindset, always following the crowd. An added element is the interaction between the artwork and the viewer. When someone approaches the little boxes, the projected people stare up timidly; as the viewer walks past, the people start screaming and running away, deathly afraid of anything outside their comfort zone. The interactive narrative has five different “responses” that the mini crowds could have towards the giant spectator. These include hanging out when no one’s around, moving into a “fear area” when someone comes close, starting to run, hiding from a new “attack”, and escaping in groups. Bego M. Santiago was born in Spain on 18 February 1980. She graduated in Visual Arts and has a postgraduation in Digital Media Art. In 2008 she became part of the art collective NiñoViejo. In 2010 she moved to Prague to work as a invited teacher at the Academy of Arts, Architecture and Design combining her teaching work with exhibitions and residencies such as: MEETFACTORY, National Gallery of Prague, Mapping Festival 2010 – Swiss, LaptopRuss – Reina Sofia Museum and Matadero de Madrid, Munich Contempo Germany, Patchlab Kraków, Poland. Currently she lives Berlin working as Art director for Mittel-Europa (ME), a curatorial project dedicated to rethink the European space through the translation, migration and hybridization process.